Coolpad and T-Mobile confirmed less than two weeks ago that a new affordable Android smartphone would be available in the United States on June 16, the Defiant. 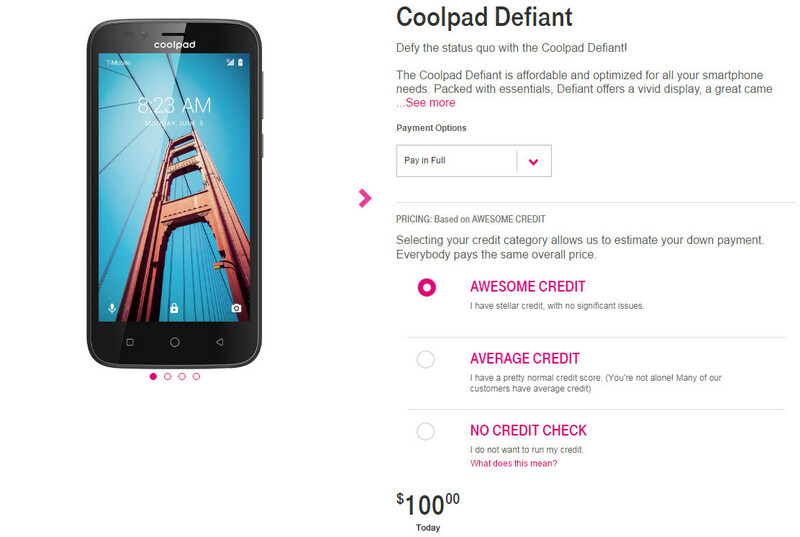 Nothing was said about the price at the time of the announcement, but since the Coolpad Defiant is now listed on T-Mobile's online store, we can confirm the smartphone is available for purchase for only $100 outright. Additionally, customers can grab the Coolpad Defiant for free on $4 monthly payments for 24 months. The best thing about Defiant aside from the low price is the fact that it runs Android 7.0 Nougat right out of the box. The rest of the phone's specs are entirely unimpressive, but that's quite understandable since this an entry-level device after all. In that regard, it's worth noting the Coolpad Defiant is equipped with a 1.4GHz quad-core Qualcomm Snapdragon 435 processor, 1GB RAM and 8GB of internal memory (expandable via microSD card). Furthermore, the phone has a 5-inch display with 854 x 480 pixels resolution, a 5-megapixel primary camera, a secondary 2-megapixel selfie shooter, and a decent 2,450 mAh battery. Also, the Defiant comes with support for RCS (Rich Communication Suite) and LTE bands 2, 4, 4, and 12. If I'm gonna throw $100 at a phone, it better have at least a gig and a half of RAM, at least qHD screen resolution, and at least 16GB of ROM. Perhaps the Snapdragon 435 octa-core processor cost them a lot, but this phone could have made do with a SD 425 instead. Anybody else have any thoughts? Same thoughts. 1 gb of ram is just sad. Get last year's G4 for $50 more. Much better phone.